The 2019 OHL Cup Powered by Under Armour Semi-Finals are set after an intense morning of Quarter-Final action at the Scotiabank Pond in Toronto. 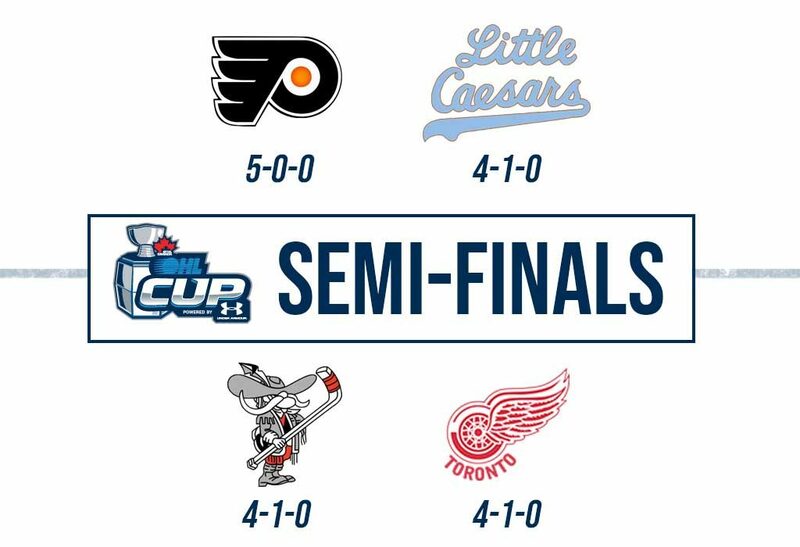 The Detroit Little Caesars, Don Mills Flyers, Toronto Red Wings and Mississauga Rebels emerged with Saturday morning victories to advance to the OHL Cup’s Final Four. The winners of tonight’s games will compete in Monday’s OHL Cup Powered by Under Armour Championship Final at the Mattamy Athletic Centre in Toronto. The Don Mills Flyers and Detroit Little Caesars lock horns in a rematch following the Flyers’ 3-0 win on Friday afternoon. Don Mills enters action on the heels of three consecutive shutouts as goaltenders Anson Thornton and Sergei Litvinov are in the midst of a 139:21 run of perfection. Talented underage forward Shane Wright has been as advertised, sitting one point back of the tournament scoring lead with 12 points (4-8–12) while leading the event with a plus-12 rating. Teammate Brennan Othmann (6-3–9) sits in a three-way tie for the showcase goal-scoring lead. The Michigan state U15 champion Detroit Little Caesars squad comes off a 4-2 win over the Halton Hurricanes on Saturday morning as standout defenceman Luke Hughes (3-1–4) scored the game winner inside the final minute of the third period. DLC has spread their scoring around as Griffin Jurecki (4-6–10) leads the way in front of Jack O’Brien (2-4–6) while five others have at least three points. Zak Brice has played all of the club’s five games in goal, posting a 1.41 goals-against average and .934 save percentage with two shutouts. Detroit is the first American team to reach the semi-final since 2013. Don Mills outshot Detroit 31-15 on Friday afternoon, going 2-for-6 on the power play. Tonight’s rematch is sure to be an intense affair. Two evenly matched teams with a history square off in tonight’s second semi-final matchup as the Toronto Red Wings and Mississauga Rebels rekindle their GTHL rivalry. The Red Wings took two of three from the Rebels during the regular season before eliminating Mississauga in the second round of the GTHL Playoffs, doing so in the dying minutes of Game 7. The Red Wings got the better of the wild card entry Rebels on Wednesday, beating them 4-1 as the Wings found a way to solve netminder Justin Wu. Red Wings captain Francesco Pinelli (6-3–9) has turned heads this week, recording a hat-trick and overtime winner in the process. He’s been joined by Luca Del Bel Belluz (6-1–7) who scored twice in Saturday morning’s 5-0 quarter-final win over the Quinte Red Devils. Across the ice, the Rebels become the first wild card entry to reach the semi-final since the 2017 OHL Cup Powered by Under Armour champion Mississauga Reps. Crash and bang forwards Pasquale Zito (3-5–8) and Max Donohoe (3-5–8) have been involved in every game while Jesse Fishman (5-1–6) leads the team with five goals. The aforementioned Justin Wu has been arguably the tournament’s best goaltender, posting a 1.60 goals-against average and .960 save percentage to backstop his team into tonight’s contest. Don’t miss the final showdown between the Toronto Red Wings and Mississauga Rebels tonight at the OHL Cup Powered by Under Armour.